Ana Faustor, a middle-age Peruvian lady takes a passionate bite of grilled fish as she follows deliberations at the UN Climate change talks in Lima – just outside the hall where the negotiations are taking place. Inside the hall, officials reflect on how dangerous climate change has become to mankind and insist that the time to act is now. But Ana`s thoughts are buried in the nostalgia of the days when fish was caught in abundance and how she used to go fishing with her father in Chimbote, in the countryside of northern Peru. She laments; “Things have changed now. Fishing is becoming difficult and fishes are disappearing,” regretting how good fish is becoming rare in Peru, a country that holds second place in worldwide production of aquatic species. As the UN Climate change conference closed in Peru, December last year, Ana hoped for an outcome that will mitigate the impacts of climate change across the globe. “That is why I attended the conference. Things are getting out of hand. We do not know what to do” She says. Thousands of miles across the Ocean in Limbe, a town in the West African country, Cameroon, Enoh Joseph shares her sentiments. An empty net lying beside him tells a story of hopes and dashed hopes. “My catch has reduced drastically. I often stay for days without going to fish because of bad weather. It was not like this before; fishing was good and I was wealthy and suddenly the sea became angry with us. Sometimes I wonder what we have done wrong to Mother Nature” says Enoh who has been fishing for over two decades. Ana may be worried about the decreasing fish catch in Peru, but for African fish traders and fishermen like Enoh, it is a question of life and death. These are perilous times for him and his family. The West African region is home to about 43% of the total population in Sub-Saharan Africa. The fishery sector plays an enormous role on the national economies of the region and constitutes the main livelihood for a majority of people living along the coasts and in riparian areas. Countries like Senegal, The Gambia, Sierra Leone and Ghana largely depend on fisheries for their national economies and as a major source of foreign revenue. In Cameroon, Benin, Ghana, Mali, Mauritania and Senegal, more than half of the population consumes fish products daily. According to a report by the UN Food and Agriculture Organisation (FAO), in 2012, high demand for fish and associated products led to more than ten million fishers, fish processors and fish traders in the region, besides other jobs such as boat building and small scale business in the fishery sector. In Cameroon, fishing provides jobs for marginalized groups mostly women who dominate processing, retail and local trading of fish products. But climate change is threatening the flourishing industry. “The scientific report has made it clear that the impacts of climate change will be more intense and more frequent and the fishing industry is not left out. Because of rising sea levels and floods, fishermen are finding it difficult to go fishing with the boats in the troubled waters. Many have to stop fishing” says Robert Chimambo, a member of Pan African Climate Justice Alliance (PACJA), a continental coalition of Civil Society organisationsdefending the position ofAfrica in climate changenegotiations. 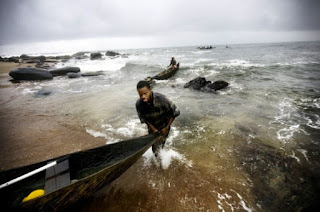 “In Cameroon forinstance, fishermen arecomplaining they can`t gointo the sea because of thewild waves. As a result themarket supply is affectedand that goes acrossAfrica” he adds. Forecasts of fishproduction in the futureindicate that majority of thefisheries will be affected byclimate change and maycause food insecurity. Withregional fish stocks alreadyon the decline, per capitafish consumption hasdropped. FAO speculatesthat demand for fish willexceed supply in WestAfrica, with an annualdecrease in fish supply by4% per year, leading to asupply deficit of 3.6 millionin 2015. “The fishery productivity ofWest Africa is highlyvulnerable to projectedimpacts of climate change.The region is ill-prepared tosafeguard the fisherysector from theseprojections. Consequently,the traditional supportprovided by the fisheriessuch as food security isthreatened if not indeterioration, and it is notwell known whether theregion would be able tomeet its nutritionaldemands under the worstcase scenario of climatechange” says RobertKatikiro who hasresearched broadly on theimpacts of climate changeon the fish industry inAfrica.In a study conducted in2012, Katikiro and EdisonMacusi found that themagnitude of the problemin terms of its severity andproportion of the populationaffected differ from countryto country even athousehold level. Accordingto the study, foodproduction has dwindled incountries such as Liberia,Sierra Leone, Ghana, andSenegal leading to theirdependence on food aid. “The reliance on foreignfood staples means that no country in the region is self-sufficient in terms of foodproduction” says Katikiro.FAO estimates that Africawill need adequate foodsupplies for 18 millionadditional people each yearand to improve thenutritional status of the 94million people currentlyundernourished if it is tomeet the MillenniumDevelopment Goals. Experts are unanimous thaturgent actions need to betaken to improveawareness of fishers andfishing communities aboutthe impacts of climatechange on their livelihood. “Concerted efforts shouldbe taken from local toregional levels to addressadaptation to climatechange. Fishers and fishingcommunities should beempowered to make theirventures to other livelihoodoccupations and theirFisheries should beclimate-proofed” saysKitikiro.Chimambo is committed toensuring that activities thatmake people, ecosystemsand infrastructure lessvulnerable to the impacts ofclimate change are raisedand fully addressed andencouraged by the UnitedNations FrameworkConvention on ClimateChange (UNFCCC). “Basically the wholeprocess of adaptation is totry and raise those issues.How do our people getcompensated for thisdamage? That is why thenegotiations for loss anddamage are crucial. Andour people (Africans) didnot cause the damage;they are victims of climatechange which is causedprincipally by developednations. The technologythat we were using whenthe sea was normal isgetting out of place. So weneed research to introducenew methods of fishing.And that requiresinvestment, not fromAfrican governments’budgets but developedcountries that areresponsible for climatechange” he says. Certainly, there is a lot atstake here. Genuine anduniversally accepteddecisions need to be takento rescue people like Anaand Enoh from perishing asa result of climate change. “We are keen onadaptation but adaptationshould not delay mitigation.We need a text on how theagreement will look like.We want what is good forAfrica. We want agreementand commitment” saysRuth Mitei of CAREInternational. Africa is confident that if itsposition is implementedthen it will substantiallyreduce the adverse effectsof climate change but thisrequires money, lots of it.Developed countries havecommitted to mobilizing$100 billion in climatefinance per year by 2020 tosupport climate adaptationand mitigation indeveloping countries butthe African Group at theUN Climate change talks is concerned that thepledge is far belowexpectations but it`s firmthat it is the baseline for theclimate negotiations. "Recent pledges to theGreen Climate Fund are asmall first steps, butfunding around $2.4 billionper year is not close to theactual need, and is a farcry from the $100 billionpledged for 2020" saysSeyni Nafo, African Groupspokesperson.The money is expected tocome from a wide variety ofsources and depends onmeaningful mitigationaction and transparency onimplementation bydeveloping countries. It isintended to bridgedifferences between richerand poorer states thathobbled prior talks. The AfricanGroup made itclear though the money isimportant, Africa is moreinterested in limiting theimpacts of climate change.Africa hopes that theConference of Parties(COP21) to take place in Paris in December this year will seal an agreement on howto fight against climatechange that will respect its position.